Please note all non-US orders, commemoratives and certain other sample orders will ship from our UK address. Please also see our Stock Chips website for further sample sets. Set of 38 plain color samples (all on 39mm A-Crest mold), one of each of the current colors shown on the color chart page. 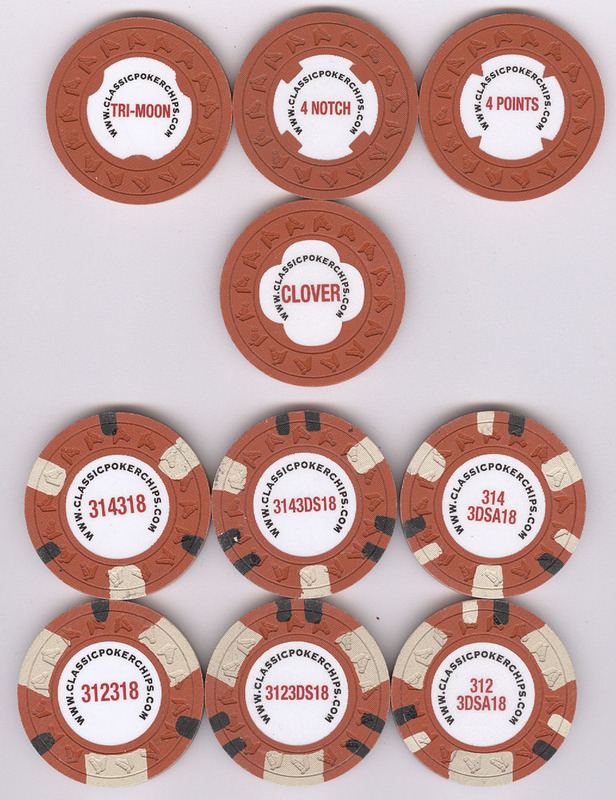 Example shown here (note that chips supplied are blank without colors marked). Price $49.50 shipped. Set of 38 hotstamped (color name on one side) color samples (all on 39mm A-Crest mold), one of each of the current colors shown on the color chart page. Example shown here. Price $69.50 shipped. Set of 38 inlaid color samples (all on 39mm Scroll mold), one of each of the current colors shown on the color chart page. Example shown here. Price $92 shipped. Set of 38 inlaid color samples (all on 44mm Scroll mold), one of each of the current colors shown on the color chart page. Example shown here. Price $130 shipped. 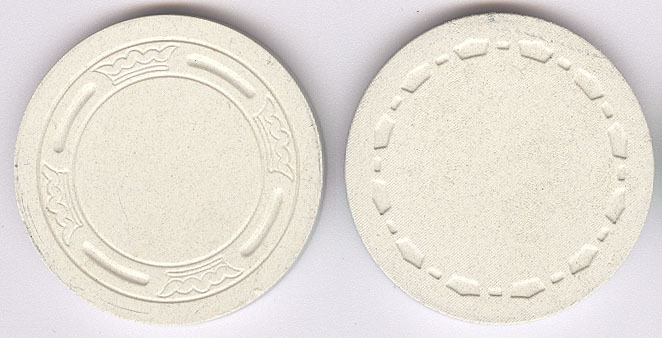 Pair of plain white mold samples, one of each from the large and small crown molds. Example shown here. Price $6.50 shipped. Set of 4 large & small crown mold samples, comprising one each plain and inlaid chips from both molds. Example shown here. Price $10.50 shipped. Selection of 10 different inlaid 39mm samples (our random choice from current inventory) to give a representation of our current chip styles. Example shown here. Price $21 shipped. Selection of 3 different 44mm samples (a plain white mold sample from each mold plus our random choice from current inventory of 1 inlaid sample). Example shown here. Price $11 shipped. Set of 7 shaped inlay samples (all 39mm FDL mold). Example shown here. Price $20 shipped. Set of 70 inlaid edge spot and inlay samples (all 39mm HHR mold). As shown here. Price $236 shipped. Add-on set to the above - 17 inlaid edge spot samples (all 39mm HHR mold). As shown here. Price $68 shipped. Add-on set to the above - 10 inlaid edge spot and shaped inlay samples (all 39mm HHR mold). As shown here. Price $37 shipped. Complete set of all 97 inlaid edge spot and inlay samples in the three listings above (all 39mm HHR mold). Price $330 shipped. 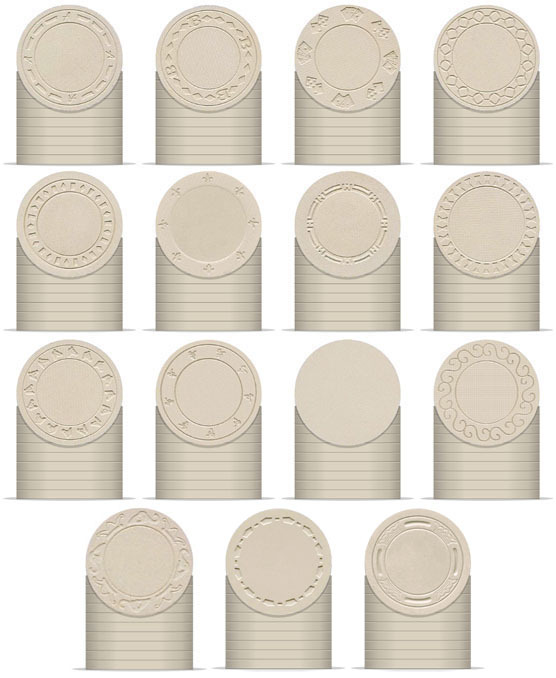 Set of 24 inlaid edge spot samples (all 44mm Scroll mold). As shown here. Price $120 shipped. Selection of 4 hot-stamped samples (all gold foil on Jockey mold in colors shown) being one from each stock die type set (our choice of letters/numbers). As shown here. Price $9 shipped. Set of 6 hot-stamped samples (all on Jockey mold in colors shown) being one of each foil color. As shown here. Price $12 shipped. 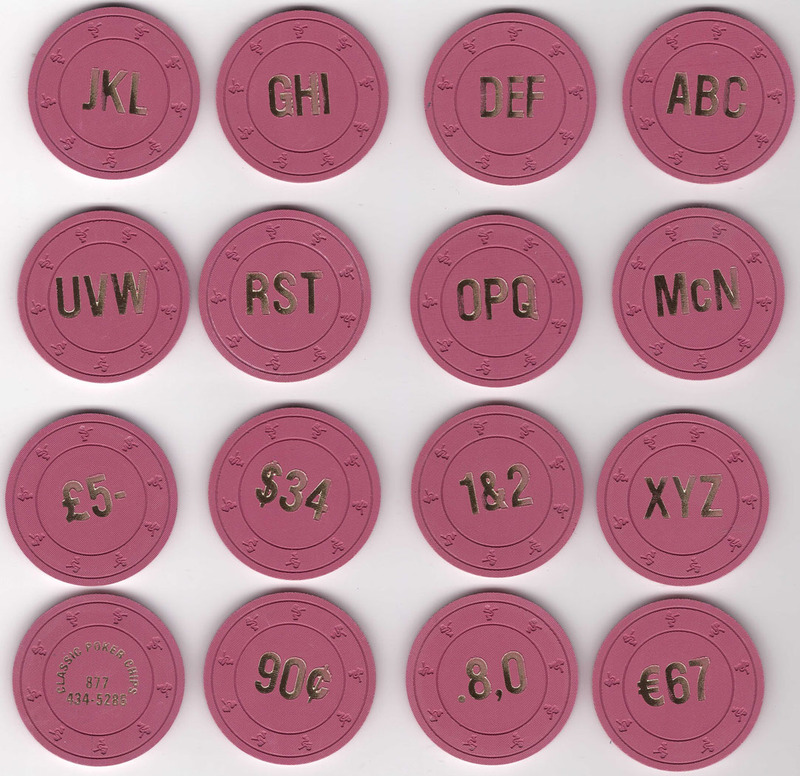 Set of 15 hot-stamped samples (all gold foil on Jockey mold in color shown) showing a full set of all characters available in the NEW font set. As shown here. Price $27 shipped. 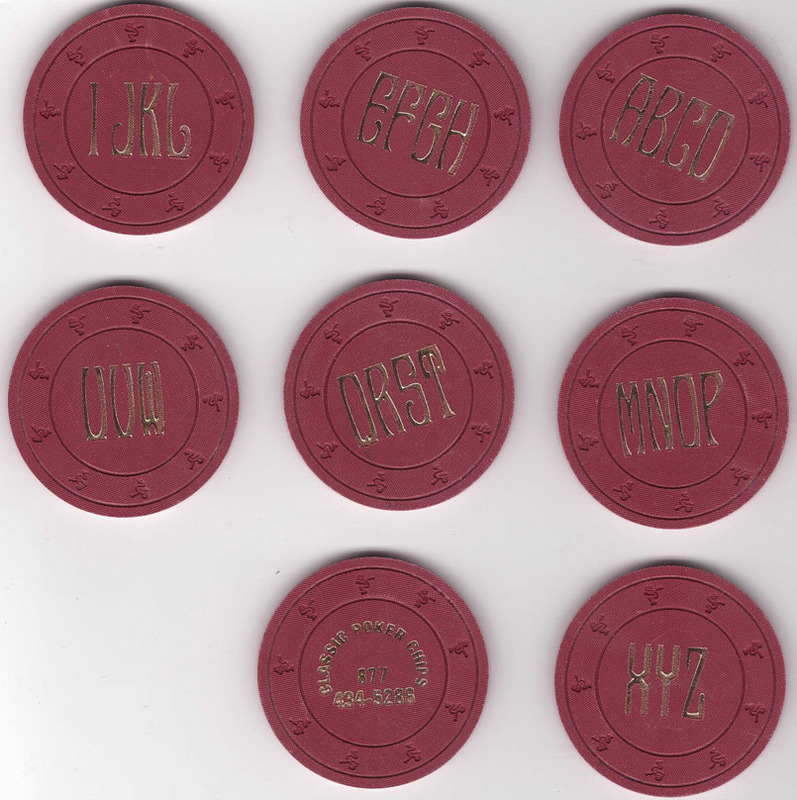 Set of 7 hot-stamped samples (all gold foil on Jockey mold in color shown) showing a full set of all characters available in the OLD font set. As shown here. Price $14 shipped. Set of 3 hot-stamped samples (all gold foil on Jockey mold in color shown) showing a full set of all characters available in the NUMERAL set. As shown here. Price $8 shipped. Set of 13 hot-stamped samples (all gold foil on Jockey mold in color shown) being a full set of all denominations available. As shown here. Price $23 shipped. 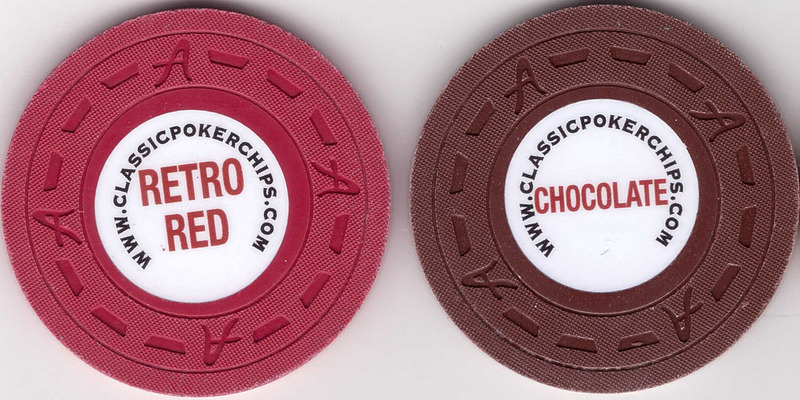 Set of 6 sample chips, one of each of the all the different types shown on the ceramic chips page (excluding the 43mm hybrid). Price $11 shipped. Set of 9 sample plaques, one of each of all 4 sizes shown on the ceramic plaques page in both rectangular and oval, plus one thin credit card sized plaque. Price $70 shipped. Selection of 3 samples plaques (our choice of size) comprising one of each of the rectangular, oval and credit card sized plaques shown on the ceramic plaques page. Price $25 shipped. A Level 1 2019 subscription for all colors of all the commemorative chips that we create during 2019 (including giveaways). Subscription chips will be shipped twice a year (early July/early Jan). 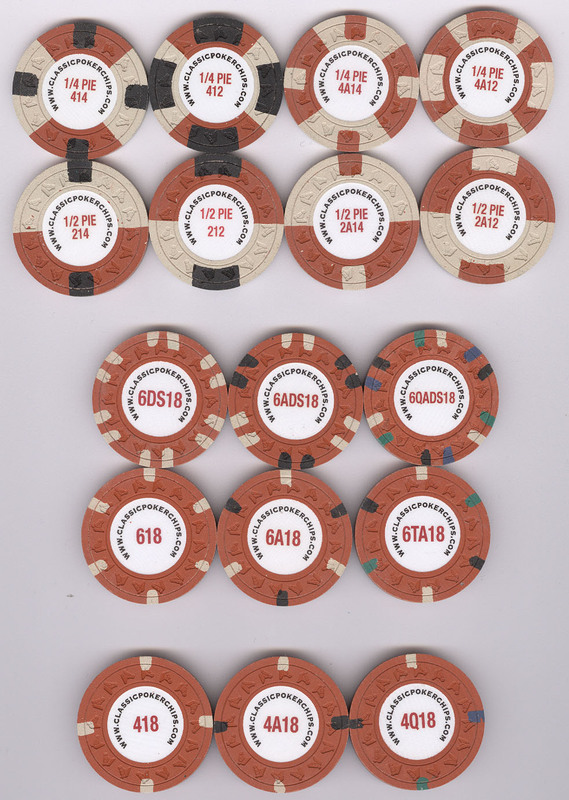 The picture shown in the 2016 subscription below is a representation of the type of chips that will be included. Will comprise approx 20 chips. Level 1 will currently be limited to 18 subscribers. Price $56 shipped. 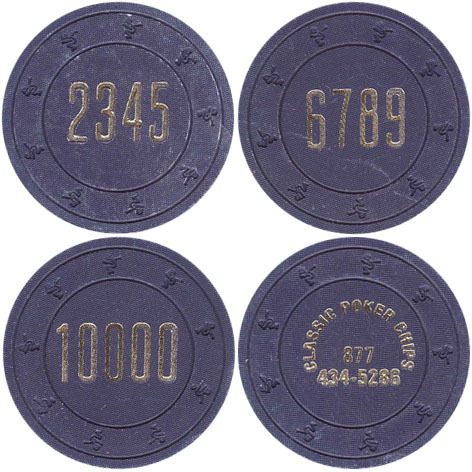 A Level 2 2019 subscription for one color each only of all the commemorative chips that we create during 2019 (including giveaways) per the Level 1 description above. Subscription chips will be shipped twice a year (early July/early Jan). Will comprise approx 10 chips. Level 2 will currently be limited to 10 subscribers. Price $28 shipped. A Level 1 2018 subscription for all colors of all the commemorative chips that we create during 2018 (including giveaways). Subscription chips will be shipped twice a year (early July/early Jan). 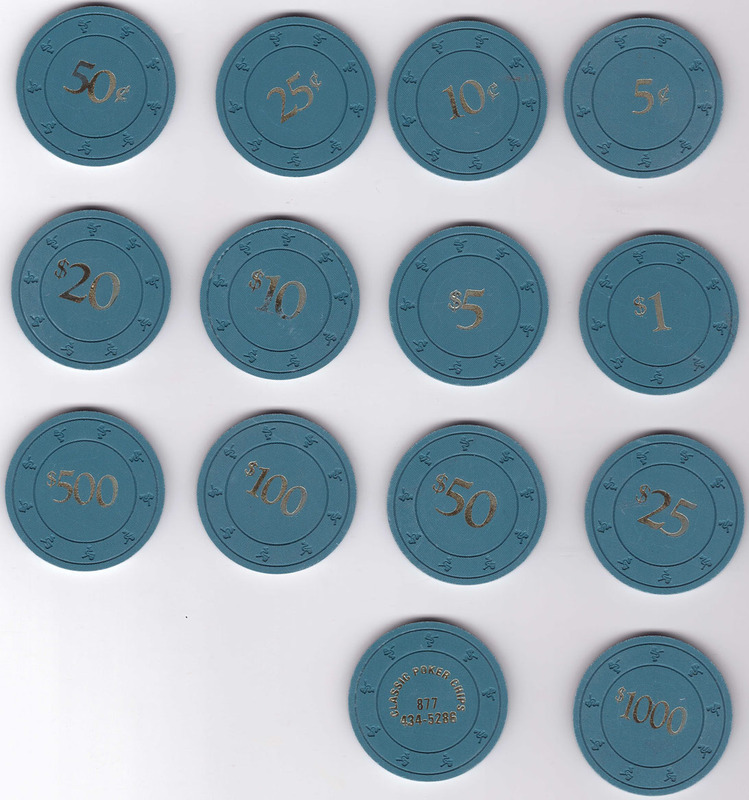 The picture shown in the 2016 subscription below is a representation of the type of chips that will be included. Comprises 20 chips. Price $54 shipped. A Level 2 2018 subscription for one color each only of all the commemorative chips that we create during 2018 (including giveaways) per the Level 1 description above. Subscription chips will be shipped twice a year (early July/early Jan). Comprises 10 chips. Price $27 shipped. 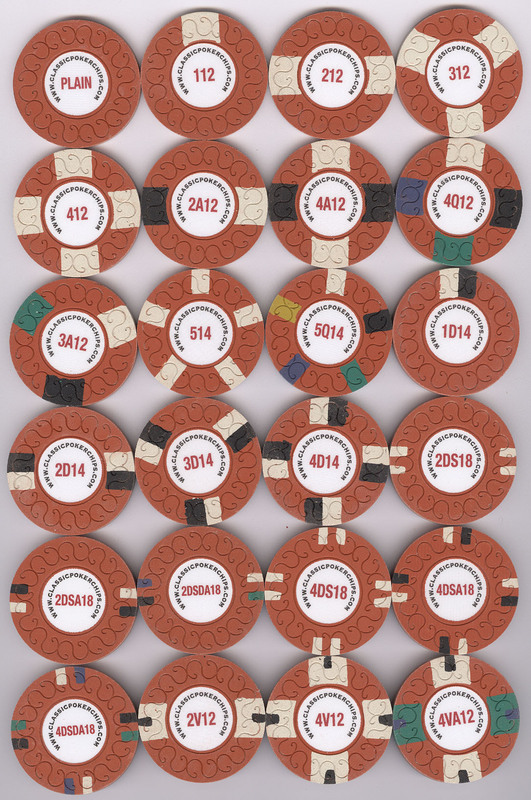 A retrospective Level 2 2017 subscription for one color each only of all the commemorative chips that we created during 2017 per the Level 1 description above. Comprises 10 chips. (only 1 still available) Price $27 shipped.